Preparing for Painting and Staining | Greg Martineau Projects Inc. This is the trim around your new windows and doors. Casings are typically unfinished when they’re installed, allowing you to customize them to suit your own tastes. If you plan to paint your casings, you’ll need to buy some wood filler. All casings usually have nail holes or small gaps that need to be filled prior to painting. Most home improvement or paint stores can assist you in choosing filler that matches your choice of paint. Many people aren’t aware that all new wood windows must always be finished with paint or stain. This isn’t merely for cosmetic reasons. The paint or stain helps to protect the windows from the elements and from everyday occurrences that may damage the wood. At Greg Martineau Projects, we recommend using a high quality exterior alkyd or acrylic latex product. Once again, these can usually be purchased at most home improvement or paint stores. 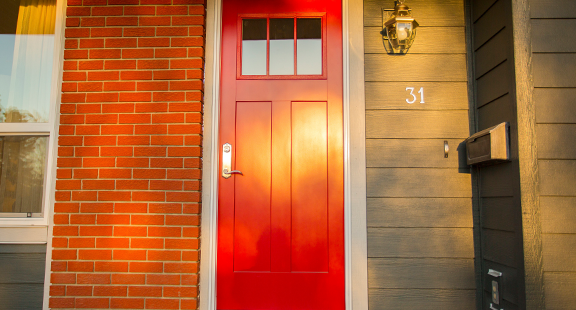 On their exterior doors, most people prefer to use paint that compliments the character of their home. However, paint is also required under the terms of your comprehensive warranty. The door slab, including the top and sides, needs to be painted to protect your door from the elements. When you purchase your exterior door, it will already have been painted with a high-quality primer, so further priming isn’t required. We recommend a high quality exterior alkyd or acrylic latex product for steel doors. Fibreglass doors can be treated with a high-quality exterior acrylic latex paint. Home improvement and paint stores generally have a good selection of both types of paint to choose from. The staff will usually be able to help you match an existing colour, obtain product specifics or provide instructions on the best product for your particular project.